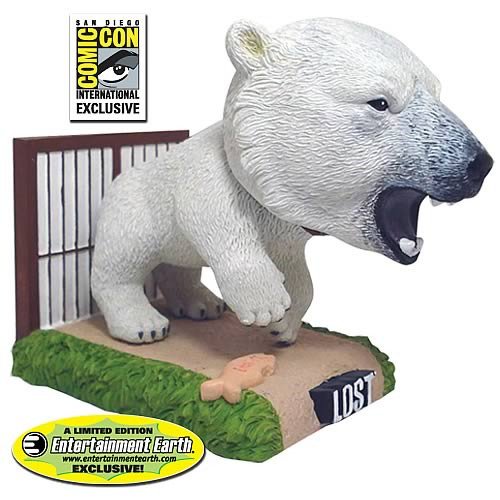 Sensational Polar Bear Bobble Head out of the Lost TV series! SDCC Exclusive from Bif Bang Pow! Take home this unlikely island inhabitant! Themed base features a cage wall and fish biscuit! Entertainment Earth Comic-Con San Diego 2011 Exclusive! Deftly crafted of resin by Bif Bang Pow!, this sensational Polar Bear Bobble Head stands approximately 5 1/2-inches long x 4 1/4-inches tall x 2 1/2-inches wide and features superb detail that's accurate to the mega-popular Lost TV series and typical of the bobble heads in this line. Wearing a Dharma Initiative collar, its amazing themed base features a cage wall and fish biscuit. Don't miss this opportunity to add the Polar Bear Bobble Head to your Lost collection!